So, you love wood, real wood, but hate the maintenance. Wood is warm and rich; it has interesting grain and color. It’s strong and natural and authentic. It is not trying desperately to look like something it isn’t. A wood deck can be the centerpiece of your backyard, adding a new texture next to the grass, the flowering bushes and your natural stone patio. No shiny plastic furniture for you. But, you know the problem: you’ll spend several hours on your hands and knees every year treating it with some stain. If you don’t, it will fade, get splintery, look ugly, and even rot. Ugh. So, what’s the alternative: Plastic? It’s an outdoor hardwood from South America that is very durable – durable in all senses of the word. Ipe is highly resistant to fungus, rot and termites. It is extremely hard, harder than oak; so it will resist scratches and stand up to rough use. And ipe is long lasting; the US Forest Laboratory gives ipe its highest longevity rating — over 25 years. Many others claim it will last over 40 years. Ipe is so dense that when put in water, it slowly sinks. It has a very fine, tight grain, so it does not splinter. And if this isn’t durable enough for you, ipe carries a Class A fire resistance rating, the same rating as concrete. Color. Ipe starts out a rich brown color, but the sun bleaches it to a silvery grey. It you do not clean and treat it, it stays grey. Ipe does not rot, insects do not like it, and it does not splinter. But it does turn grey. The issue, then, is: Do you like grey? 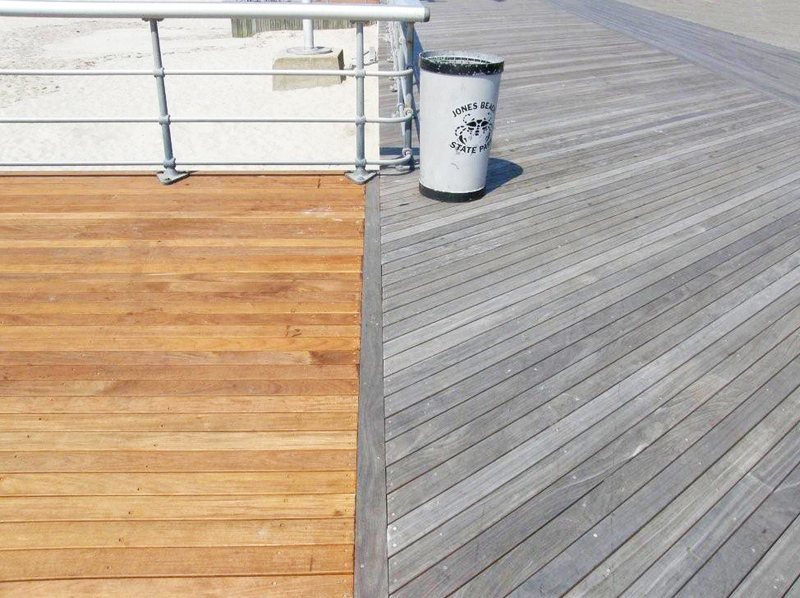 Here is fairly new ipe beside weathered ipe on the same high traffic boardwalk on Jones Beach in NY. Longevity: How long will your ipe deck last ? Hard to say because ipe is so hard (sorry) durable. If properly built, it will certainly last 40 years. Read more in my article about deck longevity. And Price? Per square foot, 1×4 ipe costs about the same as pvc or plastic coated decking, like Azek or Timber Tech XLM. Because of ipe’s strength, 1×4 decking provides a solid surface; plastic decking is much weaker and requires a thicker board, 5/4 x 6. Are you concerned about preserving our environment? Then you might prefer ipe that is certified by the FSC Forest Stewardship Council to be renewable and responsibly grown. The plastic based synthetics are made from fossil fuel oil. For detailed ipe specifications, click here or here. We at Advantage Design & Construction offer professional design and build services for clients west and north of Boston. Over the past 26 years we have designed and built over 950 projects. We have enhanced the depth of our expertise by limiting our work to decks, porches, and sunrooms. To view some of these projects, visit our website. To learn how we treat our clients, check us on Angie’s List or read a recent article about us in Remodeling Magazine. For a free design consultation and a relaxed and rewarding experience, contact us via e-mail, subboston@archadeck.net or by phone, 781-273-3500. PreviousWhich Cedar for your new Deck? NextPlanning to renovate your pre-1978 house? Take note. Great write up and that is a great picture of new ipe vs silvered. 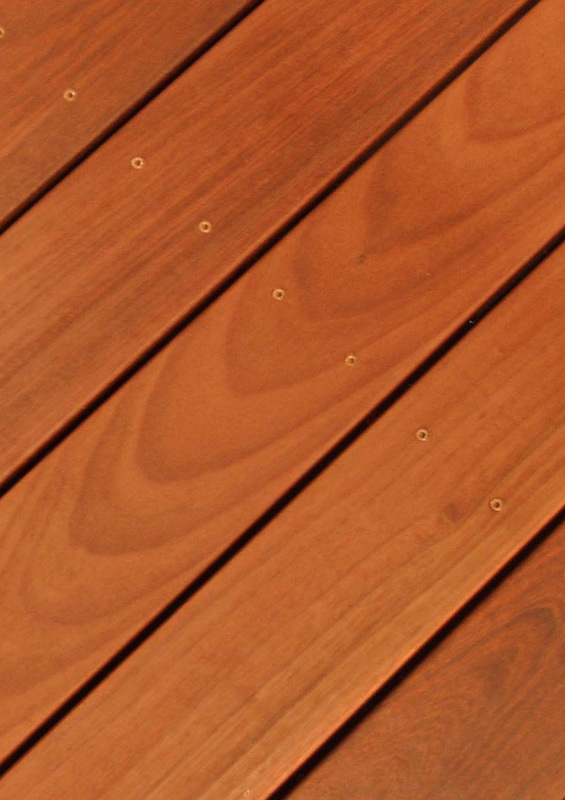 very nice information about to maintain wood for deck…. If you do install Ipe but you do not maintain it and the wood turns grey, can you resand the wood to get rid of the grey and apply a stain color that you like? You could sand off the top layer of grey wood on a deck and doing so would bring back natural color, but that would be very labor intensive. Professional floor re-finishers have large, efficient sanders, but most do not want to sand deck for fear that nails or screws sticking up will damage their equipment. More feasible is to power wash your deck with clear water. Chemicals are not necessary. The high pressure machines are very powerful and can do an excellent job of bringing back most of the original color. After drying, you could then re-treat. Power washing evenly and safely takes some technique.